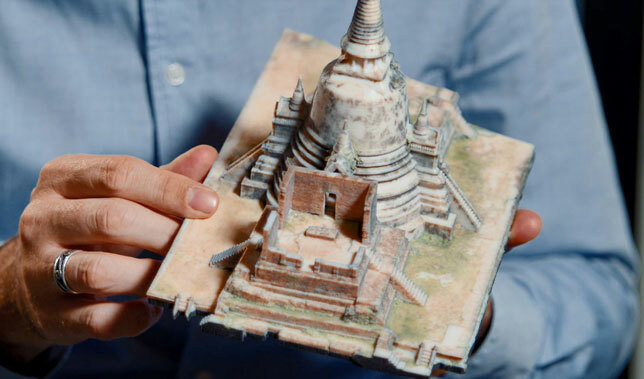 Google Arts & Culture, a Google project making high-resolution images of museum collections available to the public in an online repository, is now using 3D printing to bring historical artifacts and monuments to life for its Open Heritage Project. The Open Heritage Project uses technologies such as 3D laser scanning and photogrammetry to create textured 3D models available for download around the world. It also makes physical recreations of the models using the advanced color and multi-material functionality of the Stratasys J750 3D Printer. The relics range from scale models of ancient temples in Thailand to Neolithic rock art in Somalia. "The project was to explore physically making these artifacts in an effort to get people hooked and excited about seeing pieces in a museum or research context. That's when we turned to 3D printing," said Bryan Allen, design technologist at Google, in a statement. "With the new wave of 3D printed materials now available, we're able to deliver better colors, higher finish, and more robust mechanical properties — getting much closer to realistic prototypes and final products right off the machines." The Stratasys J750 3D Printer offers "more than a half million distinguishable colors and materials – from rigid to opaque, flexible to transparent," according to information from the company, allowing for the creation of highly realistic models. "Combining rich colors and translucency in a single print, designers and engineers can build models with heightened levels of accuracy and realism — mirroring opaque or transparent structures, and even complex materials like rubber," explained Rafie Grinvald, enterprise product director of rapid prototyping at Stratasys. The Open Heritage Project website features an overview of each historical location along with its downloadable 3D model, available for use under a CC-BY license.